Are You Bad Enough For Data East Arcade Classics? Fifteen classic arcade games are heading to the Wii early next year, courtesy of Majesco and the Data East Arcade Classics collection. Are you a bad enough dude? 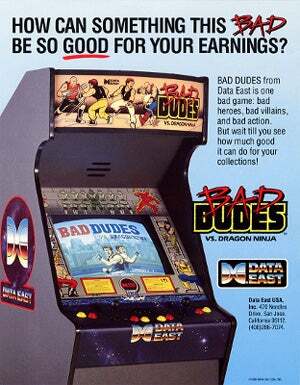 Bad Dudes vs. Dragon Ninja is just one of the many excellent arcade titles Data East created back in the day. Titles like BurgerTime, Side Pocket, and Magical Drop are all the sort of arcade games that you forget about until someone mentions them, and then you're flooded with fond memories. Majesco hopes to help you recapture those memories with Data East Arcade Classics for Wii, a collection of fifteen of the best games Data East had to offer, with full multiplayer support so you can share them with friends and family. Other games in the compilation include Burnin' Rubber, Heavy Barrel, Caveman Ninja, Side Pocket, and BurgerTime sequel Peter Pepper's Ice Cream Factory. If those names don't get you excited, then you're probably much younger than I am. Mind you we knew this was coming, and we knew it so well that I used nearly exactly the same headline as McWhertor did when reporting on the ESRB rating for the game early last month. Are You A Bad Enough Dude For This Data East Collection? Data East Arcade Classics should hit the Wii early next year, priced to move at $19.99.